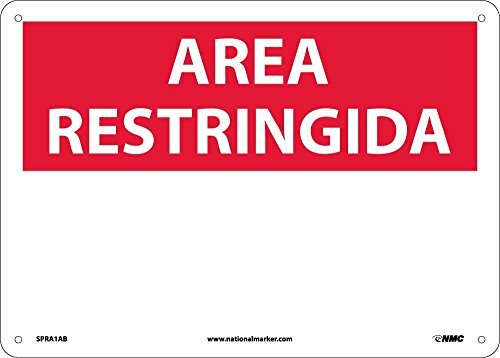 National Marker Corp. SPRA1AB Area Restringida, Blank, Sign, 10 Inch X 14 Inch, 0.040 Alum by National Marker at Cames Egtrab. MPN: SPRA1AB. Hurry! Limited time offer. Offer valid only while supplies last. Ppe/fall protection signs remind workers of Safety Precautions needed where dangerous or toxic substances or hazardous work conditions may exist. Ppe/fall protection signs remind workers of Safety Precautions needed where dangerous or toxic substances or hazardous work conditions may exist. Post signs reminding workers of the protective equipment required for employees to protect themselves on the job. Our personal protection and fall hazard signs can keep your employees safe with our durable, high-quality signs protected by Sign Muscle.